One of the most popular cosmetic dental procedures today are porcelain veneers. Porcelain veneers, or dental veneers, are a thin porcelain cover that fit like a cap over a broken, damaged or discolored tooth to restore or improve a smile. Natural Appearance – Dental veneers are a natural looking extension of your actual tooth, without requiring the complete replacement of a tooth. Advancements in dental technology have allowed us to make an amazingly realistic-looking translucency in high-quality dental veneers. Many of our patients are amazed at just how real they look and how naturally they feel and function. Durability – Because dental veneers are made of such a strong porcelain or composite material, you need not worry about the tooth veneer easily chipping or breaking. Also, because they are permanently affixed with extremely strong adhesives, you will usually not need to worry about them popping or falling off. Conservative – While veneers usually require some removal of enamel, the procedure leaves most of the tooth structure intact. Compared to crowns, which require reshaping of the entire tooth and the removal of a large amount of material, porcelain veneers are a more conservative option to improve your smile. Not to mention, gum tissue tolerates porcelain well, helping to keep the rest of your oral health in balance. 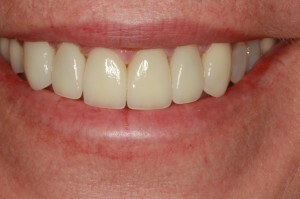 Another term used with tooth veneer procedures is “prepless veneer”. Because prepless veneers are so thin and perfectly fitted to the tooth, there is no “prep” work needed before they are placed. This prep work can include grinding or shaving of teeth, or another process needed to prep the surface of the tooth to provide a platform for the tooth veneer to be placed on. Ultimately this means a faster, more comfortable cosmetic dentistry procedure to create your ideal smile. Because dental veneers are “surface treatments” and don’t require replacing an entire tooth or other more timely procedure, the cost is surprisingly affordable. The gap between you and your dream smile may end up being only as thin as a tooth veneer. If you’re near Missoula or Lolo and are interested in how a tooth veneer could help your smile, call, text, or contact us using the form below to schedule a visit with cosmetic dentist Dr. Brett Felton. After an examination, Dr. Felton will be able to tell you if you are a candidate for dental veneers. We look forward to meeting you and discussing porcelain veneers!